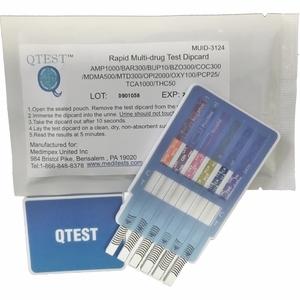 This NEW 12-Panel/Dip Device is water/urine resistant reducing the chances of an invalid test if the test panels are dipped (in the sample) past the edge of the dipstick card. Dip the strip(s), of the test card, vertically into the urine specimen for at least 10-15 seconds until visible sample migration up the strips and across the test panels is observed. Invalid: No line appears in the control region (C). The test is invalid even if there is a band in the test region (T). If the test device does not produce a band in the control region, check the testing procedures, samples, and/or control materials and repeat the test using a new device. The One Step 12 Drugs Dip Panel test is one of our most cost-effective urine drug testing kits—just dip the drug test kit and read the results for 12 drugs groups in seconds. This tests is also known as Construction Panel Theme Card, because when they need to hire new employees for big construction contracts, it's far better to exclude drug addicts.